"It's a disgrace": Inside American schools' horrific "scream rooms"
The room where they locked up Heather Luke's 10-year-old son had cinder block walls, a dim light and a fan in the ceiling that rattled so insistently her son would beg them to silence it. The room that officials benignly called the "quiet area" so agitated the tall and lanky blond boy that one day in March 2011, his mother said, Carson flew into a panic at the mere suggestion of being confined there after an outburst. He had lashed out, hitting, scratching and hurling his shoes. Staff members held him down, then muscled him through the hallway and attempted to lock him in, yet again. But this time, the effort went awry. Staffers crushed Carson's hand while trying to slam the door. A surgeon later needed to operate to close the bleeding half-moon a bolt had punched into his left palm. The wound was so deep it exposed bone. Carson's ordeal didn't take place in a psychiatric facility or juvenile jail. It happened at a public school. But such limits don't apply to public schools. The practices—which have included pinning uncooperative children facedown on the floor, locking them in dark closets and tying them up with straps, handcuffs, bungee cords or even duct tape—were used more than 267,000 times nationwide in the 2012 school year, a ProPublica analysis of new federal data shows. Three-quarters of the students restrained had physical, emotional or intellectual disabilities. Children have gotten head injuries, bloody noses, broken bones and worse while being restrained or tied down—in one Iowa case, to a lunch table. A 13-year-old Georgia boy hanged himself after school officials gave him a rope to keep up his pants before shutting him alone in a room. At least 20 children nationwide have reportedly died while being restrained or isolated over the course of two decades, the Government Accountability Office found in 2009. "It's hard to believe this kind of treatment is going on in America," says parent and advocate Phyllis Musumeci. A decade ago, her autistic son was restrained 89 times over 14 months at his school in Florida. "It's a disgrace." The federal data shows schools recorded 163,000 instances in which students were restrained in just one school year. In most cases, staff members physically held them down. But in 7,600 reports, students were put in "mechanical" restraints such as straps or handcuffs. (Arrests were not included in the data.) Schools said they placed children in what are sometimes called "scream rooms" roughly 104,000 times. A Minnesota Department of Education report shows these three common restraints. So-called prone restraints are known to restrict breathing and can be lethal to children. About half of states don’t have a law prohibiting public schools from using such restraints. Minnesota is enacting regulations to limit prone restraints. Those figures almost certainly understate what's really happening. Advocates and government officials say underreporting is rampant. Fewer than one-third of the nation's school districts reported using restraints or seclusions even once during the school year. Schools that used restraints or seclusions at all did so an average of 18 times in the 2012 school year, the data shows. But hundreds of schools used them far more often—reporting dozens, and even hundreds, of instances. School superintendents who defend the practices say they are needed to protect teachers and children when students grow so agitated that their behavior turns dangerous. They argue that if educators don't have the freedom to restrain and isolate children as they see fit, they will be forced to send more students to restrictive settings such as residential institutions. "We believe the use of seclusion and restraint has enabled many students with serious emotional or behavioral conditions to be educated not only within our public schools, but also in the least restrictive and safest environments possible," the American Association of School Administrators wrote in a 2012 position paper. Most critics of restraints agree they are sometimes unavoidable. But they say schools too often fail to try alternatives for calming students and use the tactics for the wrong reasons—because children failed to follow directions, for instance, or had tantrums. Indeed, in a recent survey, nearly 1 in 5 school district leaders approved of using restraints or seclusion as punishment. "We have hundreds of examples of kids who are being restrained and secluded for behaviors that do not rise to the level of causing harm to themselves or others," says Cindy Smith, policy counsel at the National Disability Rights Network. Only after Musumeci's son, Christian, who is autistic and has trouble speaking, started protesting when it was time to go to school—repeating, "No school, no school, no"—did she learn from school records how often he had been restrained. School workers forced Christian, who they said had become aggressive and tried to hurt himself, to lie facedown on the floor in nearly one-third of the incidents. The prone position is particularly dangerous, because it can restrict breathing. "I remember just sitting on the bed reading them and crying," Musumeci says, recalling her horror at what the records revealed. She said the school claimed to have notified her, but it hadn't. "If you did this at home," she says, "you'd be arrested." More than four years ago, federal lawmakers began a campaign to restrict restraints and seclusions in public schools, except during emergencies. Despite a thick stack of alarming reports, the legislation has gone nowhere. Opponents of the legislation say policy decisions about the practices are best left to state and local leaders. The federal government's role, they say, should be limited to simply making sure districts have enough money to train staff to prevent and handle bad behavior. But states and districts have shown they won't create enough safeguards on their own, say advocates and other supporters of the legislation. Despite years of public concern about the practices, schools in most states can still restrain kids even when imminent danger doesn't exist. This February, timed with the re-introduction of legislation to limit the practices, Senate staffers released a report concluding that dangerous use of restraints and seclusion is "widespread" in public schools. Neither practice, the report said, benefits students therapeutically or academically. "In fact, use of either seclusion or restraints in non-emergency situations poses significant physical and psychological danger to students," it warned. Rep. George Miller, D-Calif., who is pushing for legislation, doesn't stifle his anger when talking about what he sees as a need to enact basic protections for students. "I'm just stunned that you can take an action of seclusion or restraint that turns out to be harmful in almost all instances to the student," he says, "and there's no notification to the parent." "It's so fundamental: You don't traumatize children." The day Carson was hurt, Luke was shopping at a toy store when her cellphone rang. There had been an accident, a school worker told her. She found Carson sitting quietly in the nurse's office. His left hand was a swollen mass of black and blue wrapped in thick gauze. He had a bandage on his right foot. His face had a gray pallor. Luke turned to the nurse and principal. "I believe my exact words were, 'What the hell happened here?' "
We had to take him to the quiet area, the principal told her, Luke recalls. He was being aggressive. No one had called for medical assistance. Luke drove the boy to the emergency room. He underwent surgery to close the wound on his left hand and had casts put on it and on his foot, which was also broken. He spent the night in the hospital. Donald Fairheart, executive director of the Southeastern Cooperative Education Program, known as SECEP, which oversaw Carson's school, declined to comment, saying the incident occurred before his tenure. The Luke family had moved to Virginia two years before. 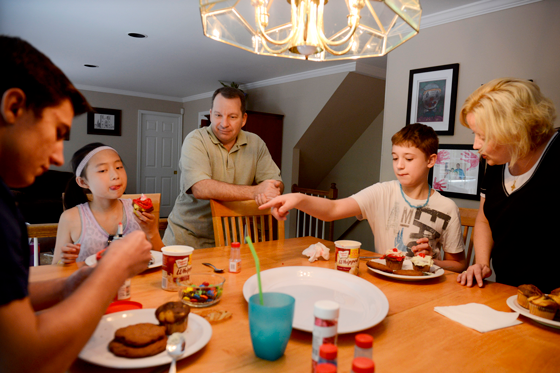 Carson was the middle child of three whom Luke and her husband, a Navy officer, had adopted. The boy had been diagnosed with autism, anxiety and attention deficit hyperactivity disorder, and while he could speak, he struggled to communicate like other kids. Misunderstandings easily frustrated him, and he was prone to outbursts that sometimes turned aggressive. Still, his previous school district in Maryland had managed his behavior well. He was in some regular classes and loved playing with kids his age. In Virginia, however, Luke says Carson was shuffled between schools before landing at the regional public school for special needs children in Chesapeake. The building was rundown, with peeling paint, rotting wood and a leaky ceiling. In Carson's class, autistic children were combined with others who had emotional and behavioral problems, Luke says. Children like Carson are easily bullied, she said, calling the mix "like putting together lighter fluid and a match." Luke had tried to get Carson transferred out. But an episode of disruptive behavior had scuttled the plan. He was faring poorly at the school. "His behavior was tanking," Luke says. "He made little or no academic progress." School staffers told Luke that Carson's behavior often worsened when he was brought into the hallway after acting out. She believes that was because he had been conditioned to expect the next step would be a trip to the cinderblock room. "He said you can hear them do the locks, which is how I know there were three," Luke says. "There were times when they would put him in there, and he would be screaming. They would say, 'If you don't shut up, we're going to put the fan on.' " He hated the sound. Both the school and Carson told Luke when he "went to the quiet area." But while Luke had noticed the dingy room when visiting the school, she hadn't realized that was what they were talking about. She also didn't understand the terror it caused Carson. "This ate at me," she says. "I really struggled with the fact that I didn't know." Carson's school reported using holds on children 177 times—an average of almost once a school day—and isolation 559 times in the 2012 school year, the federal data shows. Those numbers placed it among the top 50 schools in the country that reported using restraints and seclusions the most. Fairheart, SECEP's executive director, says the numbers are higher than most other schools because the facility primarily serves students with emotional or behavioral disorders. There is no national count of children who, like Carson, are injured during restraints or seclusions. But at least one state is keeping its own tally. Connecticut schools reported 378 holds or isolations that resulted in injuries to children in the 2013 school year. Of those, 10 were classified as "serious" and required medical attention beyond basic first aid. Restraints in Connecticut schools usually lasted less than 20 minutes, but nearly 200 of them continued for more than an hour. A quarter of the students who were restrained experienced six or more holds during the year. Nineteen students were restrained more than 100 times. The state also found that 40 percent of disabled students who were restrained had an autism diagnosis. The same was true for half of those secluded. Michigan mother Nicole Plater says her nonverbal, 9-year-old autistic son, Andy, regularly came home from public school with injuries during the past school year. She suspected that scuffles with the staff at Oxbow Elementary in White Lake—often during holds—were the cause of the scratches, fat lip, black eye, scrapes on his back and bruises shaped like fingerprints she discovered on his arm. School officials told her that Andy's aggressive behavior has forced them to restrain him. But Plater says that when she asks about marks on her son's body, "half the time, they don't have a reason for me." She grew alarmed in the fall when school staff said they sometimes strapped Andy down in an orthopedic chair that is supposed to be used only for children with physical disabilities, which he doesn't have. He hurt himself trying to wriggle free. "For safety Andy was put in chair with lapbelt," an educator wrote Plater in a note. The boy had been kicking and hitting and "started going after other students," the note said. "After he went in the chair he was trying to slide out and the lapbelt left a mark on his stomach." Plater says she asked school officials to stop using the chair, but they didn't agree to do so—until she hired an attorney. She began videotaping Andy in his underwear each morning before school and again after he came home, to document the injuries. "It's like this school's dirty little secret," Plater says. "You tell somebody, and they say 'They don't do that!' Yes, they do." Plater was so concerned about the marks and Andy's growing anxiety about going to school—he was throwing up regularly—that she kept him home for two months this spring. He wasn't aggressive at home. But she feared she'd get in trouble for truancy. After she sent Andy back to Oxbow, pending the hearing, the school suspended him twice for aggressive behaviors such as scratching, which school workers told Plater led one staff member to seek medical attention. The school told her to keep him at home. Plater has few options. She has two other children, and her husband is a welder out on disability for a serious back injury he suffered working at a steel plant. The school district has denied her request to send Andy to another regular school, instead insisting he go to an all-special-education facility—which his parents fear wouldn't be good for him. "I just wish things were different for him," Plater says. Critics of federal legislation to restrict restraints and seclusions warn such a law would cause staff injuries to rise because educators would be afraid to intervene when students were acting dangerously. But injuries have not been a problem in Montgomery County Public Schools in Virginia, which stopped using restraints and seclusion more than two decades ago, says Cyndi Pitonyak, a special education coordinator for the district. "The chances of getting injured by trying to physically restrain somebody are so much greater than the chances of getting injured while trying to calm them down," Pitonyak says. The district uses an approach called Positive Behavior Interventions and Supports, which involves identifying triggers for dangerous behavior by students most at risk for it. Educators then develop a detailed plan to prevent such behaviors and tell teachers and aides what to do if the plan fails. Over time, as students learn better ways to respond to frustration and grow comfortable with the school routine, they need fewer accommodations. "If you are able to turn those kids around prior to the third grade," Pitonyak says, "then their chances of going on without needing a lot of behavioral support are hugely increased." Advocates say that educators in schools without such programs often end up provoking students into escalating bad behaviors instead of calming them, leading to a cycle in which restraint or seclusion is used again and again. "People need to get out of the mindset that restraint and seclusion is a default," says Jessica Butler, a national advocate for children with autism. Insurance company Munich Re issued a report in January warning school districts of liability risks associated with using restraints and seclusions. Under the heading "Minimizing the risk," the document suggested districts consider policies that ban restraints and seclusion except during emergencies, notify parents promptly, improve training and document each use. In February, Sen. Tom Harkin, D-Iowa, reintroduced a bill that would permit restraints only to stop students from seriously hurting themselves or others. It would prohibit public schools from isolating children in rooms against their will. Families such as the Lukes are watching to see if it advances. In the meantime, the Lukes have been infuriated by the fact that nobody seems to have been held accountable for their boy's broken hand and foot. Police and a social services worker interviewed Carson, but officials decided action wasn't warranted. Luke says she isn't aware that any disciplinary action has been taken against the school workers involved. Carson finished the year at a private school before the family moved back to Maryland. He suffered some symptoms of post-traumatic stress disorder. "He was having unreal nightmares," says Luke, who now also works as an advocate for disabled children. "It would be things like 'I was at SECEP, and there was a monster chasing me down the hall.' "
Three years later, Carson is doing well at a private school that specializes in helping children with disabilities. He is never secluded and was physically escorted out of the classroom just twice this past school year, says Luke, who doesn't oppose using restraints to prevent injuries. Carson talks about going to college and wants to open his own pet grooming and boarding business. But, she says, he hasn't slept through the night alone since the incident in Chesapeake. "He has psychological damage," Luke says. "I do, too."